Swansea City do not intend to sell top scorer Andre Ayew and will sign another striker this month, according to coach Alan Curtis. Only bottom side Aston Villa have scored fewer goals than Swansea this season and Curtis has assured fans that new players are imminent. "We don't want to lose anyone and are trying to bring people in," he said. 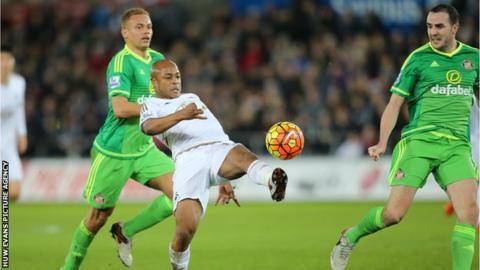 Sunderland are understood to have had a bid of £14m rejected for Ayew, who joined the Swans for free in June 2015. The Ghana forward was a free agent after his contract at French club Marseille had expired. "I didn't know there was a first bid [from Sunderland], no-one has told me, but there is no way we could contemplate letting Andre go," added Curtis. "Andre is a big player for us. There has been talk about Sunderland, but we couldn't even entertain that as far as I am concerned." Ayew has scored seven goals in 22 appearances for the Swans, including a goal against the Black Cats in last week's 4-2 defeat at the Liberty Stadium. Curtis was in sole charge of the team on Monday as Swansea beat Watford 1-0, but the 61-year-old will now hand over the reins to new head coach Francesco Guidolin. The Italian watched from the stands as Ashley Williams' first-half header secured three points against Watford. Guidolin has 16 games to ensure the club's survival in the Premier League, starting at Everton on Sunday, where former Swans boss and captain Roberto Martinez is in charge. "We all read the news, watch the TV and look at the internet, so we knew the new man was coming in and in the stands for the Watford game," Swansea midfielder Leon Britton told BBC Wales Sport. "But I think he'll have seen the game up close and personal and will be looking forward to getting on the training pitch and the players are as well."